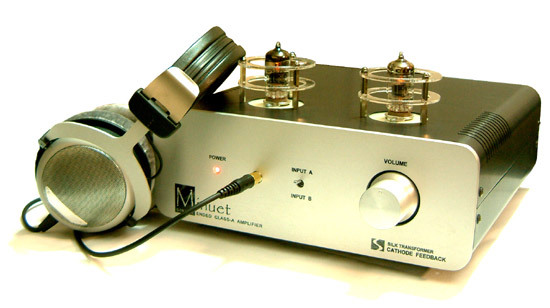 This custom made vacuum tube head phone amplifier utilizes only 1 triode (6C45Pi super tube) to drive SILK interstage line output transformer that has specific output impedance to deliver the best drive to each high-end headphone. Any output impedance to exactly match your head phone from 30 ohm to 600 ohm can be ordered specifically. 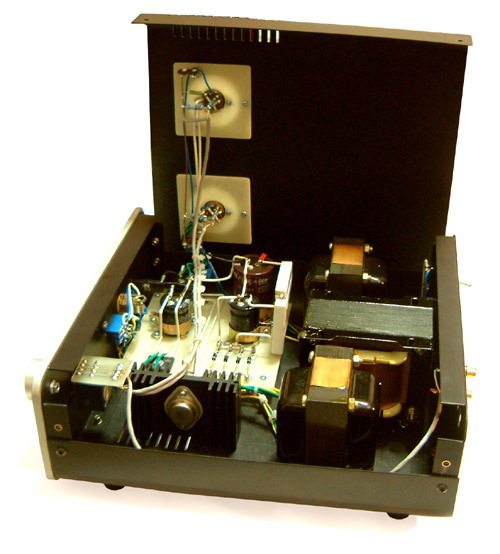 The audio circuit contains only 1 active component, that is 6C45Pi super tube, and just three more passive components, one volume control, one bias resistor, and one interstage line output transformer. we feel that this could be the most simple circuit ever implemented. The most important element to successfully implement this scheme is the quality of Interstage line output transformer. In this case we dedicate to wind SILK I-541-H from best selecting material and winding arrangement in order to achieve ultra-wide bandwidth in term of frequency response (from 10Hz to 80,000Hz at -3.0dB) while keeping the insertion loss to the minimum. The SILK interstage line output transformer performance is so great that we do not have to apply any negative feedback; therefore, this head phone amplifier will deliver unsurpass listening pleasure and purity that contains unmeasurable distortion. While prolong listening to head phone with disturbing IC circuit or transistor with heavy feedback amp or tube circuit with capacitor coupling can cause inevitable listening fatique, this effect is minimized with our design of zero feedback, zero capacitor in line amp. This circuit is most simple yet most powerful that capable of driving high impedance head phone to unbelievable performance and sound. We only make to order by using our tradition point to point hard wiring circuit and best selected component to ensure top sounding quality and long service life. All transformers are electro static shielded to prevent noise and hum and this also help improving soundstage, depth and clarity.